The company also says it's working with groups such as the American College of Radiology to develop API standards to better integrate AI into radiology workflows, EHRs and PACS. Analyzing imaging is getting a lot easier for radiologists, thanks to an increased range of artificial intelligence tools being made available. Nuance’s new PowerScribe One, the latest generation of its popular voice-enabled reporting platform, incorporates AI to aid in diagnostics and decision support. The cloud-hosted platform uses natural language understanding, image characterization, speech recognition, intelligent exchange of structured data and more to reduce inefficiencies and bolster clinicians’ accuracy. In addition to the next-gen PowerScribe platform, Nuance has also announced big growth over the past year for its AI Marketplace, which connects more than 40 developers with 70 percent of all radiologists across 5,500 healthcare facilities. The marketplace hosts developers including NVIDA, Zebra Med and Massachusetts General Hospital and others who create imaging products to augment the decision-making abilities of radiologists. Announcing the growth from the RSNA annual meeting in Chicago, Nuance says it is working with standards organizations such as the American College of Radiology to develop clear API connectivity standards more seamlessly integrate AI into radiology workflows, EHRs and PACS. With increasing workloads and more complex medical issues to diagnose, radiologist burnout is common. 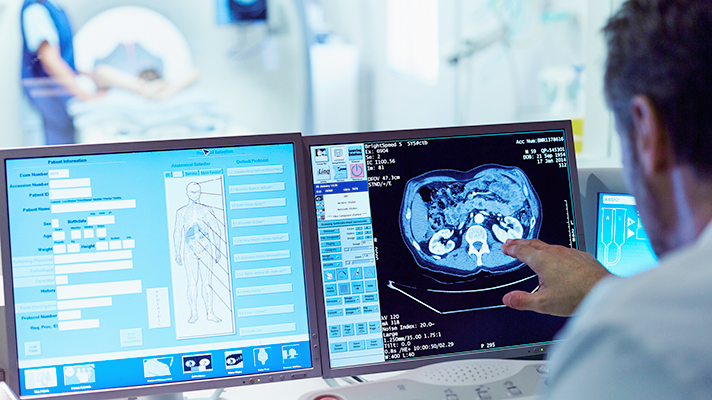 Adding AI assistance can help improve the efficiency, accuracy and completeness radiology reporting, enabling imaging professionals to spot things they may have missed by reducing the amount of duplicate work and report-building that was previously needed. "These virtual assistants could actually aid (doctors) to be more productive and efficient and get to the right parts of the report as soon as possible and not to have to repeat themselves," said Karen Holzberger, vice president and general manager for healthcare diagnostics at Nuance. But "at the end of the day the radiologist is still responsible for his diagnosis," she added, noting that many of these AI technologies can help augment the skill of the radiologist. AI is making inroads everywhere in healthcare, of course, but especially in radiology. It's helping medical professionals more efficiently interpret imaging and even enabling medical assistants to evaluate data that previously only experts could assess. Much of imaging data is currently inaccessable across systems, but new AI tools could help radiologists communicate more effictively with enriched and interactive content. Technologies such the new PowerScribe One and the growing AI Marketplace, which was launched a year ago at RSNA 2017, are meant to help address "the macro issues that our customers the radiologists (tackle) as they make their reports and interpret images," said Holzberger. Artificial intelligence and machine learning can help with "burnout and the larger problem of failed follow ups, inconsistencies of recommendations, unnecessary imaging," in addition to sometimes helping find new revenue streams, she said. MobiHealthNews Associate Editor Laura Lovett contributed to this story. In November, we take a deep dive into AI and machine learning.